When I set out to update John Chow dot Com to Version 3, one of the main objectives was to speed up page load time while being able to handle a large volume of traffic. The key to doing that is by turning the contents of the blog into a static page. This is where the WP Super Cache comes in. WP Super Cache is a static caching plugin for WordPress. It generates html files that are served directly by Apache without processing comparatively heavy PHP scripts. The plugin in an improvement to WP-Cache, which delivers pages without accessing the database. However, WP-Cache still loads the PHP engine to serve the cached files. Installation of the WP Super Cache is more involved than most WordPress plugin but if your blog has ever gone down because of a front page Digg, you’ll follow the extra steps to get this plugin working. If you have installed WP-Cache before this shouldn’t be any more difficult. 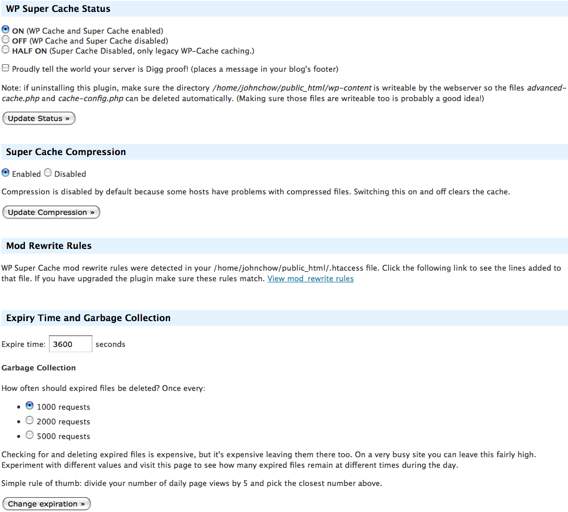 WP Super Cache offers a ton of option to increase the performance of your blog. The plugin even inlcudes a Lock Down mode. Lock Down prepares your server for huge spike in traffic (as would happen if you get a front page Digg). When this is enabled, your blog is pure static HTML. New comments on a post will not refresh the cached static files. Commentators may wonder why their comments are not showing up but that’s better than having the blog go down because 10,000 Diggers came knocking. WP Super Cache is ideal for bloggers on shared hosting. Most share hosts shut down a blog that has been Dugg not because of too much traffic. They shut the blog down because it’s using too much server resources. By turning the contents of the blog into a static file, you keep the server resource low and your web host happy.